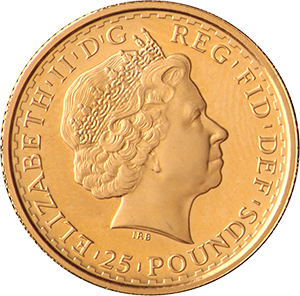 The 1/4 oz Britannia is the third largest gold coin in the collection of six, which also includes the 1/10 oz, the 1/2 oz and the one oz Britannia coins. In 2013, among other changes, a 5oz coin, with a face value of £500 and a 1/20oz coin, with a face value of 10p, were introduced. The Britannia was first issued in 1987 as government mints, in this case the British Royal Mint, began issuing bullion coins in order to compete with the Krugerrand, which made up more than 90% of the market in 1980. 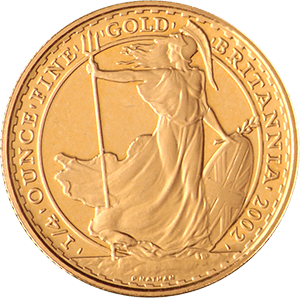 The 1/4 oz Britannia is .9999% pure, which makes it 24 carats, one of the very purest gold coins in the world. Any Britannia coins before 2013, however, were 22 carats (91.7% gold), and are therefore less valuable. The 1/4 oz weighs 7.86g and has a diameter of 22mm. It has a face value of £25, but is worth many times more than this due to its high purity and collectability. For this reason, it typically trades above the value of its gold content. The design of the 1/4 oz Britannia shows Queen Elizabeth II on the obverse and the figure of the Britannia, which was first introduced to coinage in the UK by the Romans in the second century, on the inverse. The Britannia has signified Britain’s strength and integrity over almost two millennia. The original Britannia was mixed with copper (or crowned gold), giving the coin an orange hue. In 1990, when the Britannia became the 24 carats it is today, this was replaced with silver, making the coin appear lighter in colour. The Britannia is also available in silver, which was introduced in 1997. Much like its gold counterpart, its purity improved in 2013 from 95.8% to 99.9%.